Let's look at designs for small bathrooms that speak eloquently and don't cramp your style! 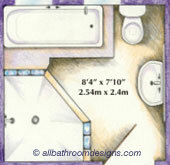 A 5'x8' bathroom is considered to be small, though the most common. Designing a small bathroom is a challenging task. But it's not difficult, nor is it impossible. It's all about putting ideas on paper and then applying some clever design tricks. Giving Your Small Bathroom A Personality! Treating a bathroom as you would your bedroom makes the job of designing it a lot less complex. A lot of small bathroom remodel ideas no longer require you to totally rip apart the existing bathroom. And the added bonus is that your bathroom will have a personality all of its own! 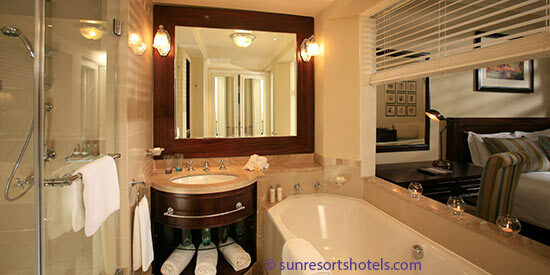 Most apartments have en-suite bathrooms now-a-days. Some excellent small bathroom remodel ideas such as the ones festured and discussed on this page, not just make your small bathrooms look big (which is really what most of us try to achieve), but warm, and exciting too. Designs to make small bathrooms appear roomier don't always require knocking down walls. Just the right tricks can help your small bathroom transform into a relaxing personal sanctuary that maybe small in size, but is BIG in STYLE!! Opening a window in the common wall dividing the bathroom and the bedroom is a fantastic way to open up the bathroom, throw in some natural light, and increase ventilation! Using pocket doors is a huge space saver and can be a design element in its own right. Transparent is in - yes! 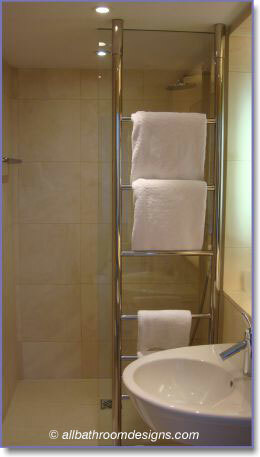 Providing adequate storage space in an en-suite bathroom is a challenging job. There are many storage styles for smaller bathrooms: using multiple towel stands, space saving storage units under the vanity or the sink, recesses in external walls etc. are the common ways. Tip: Use of glass shelves helps enhance the sense of space in a room. Since glass is transparent it gives the impression of being invisible and things stored on them seem to be suspended in air, lending an 'airy' effect! Of Pearly-Whites and Neutrals - If you're worried that you may induce claustrophobia in your small bathroom, then stay away from too many dark and deep colored fittings, surface colors and accessories. Instead, work with shades of white, gray, light pastels, and earthy tones to set the mood for a serene space. Note the use of dark splashes in the mirror and floor and behind the toilet and how they immediately draw your eye and become the focal point in this bathroom. 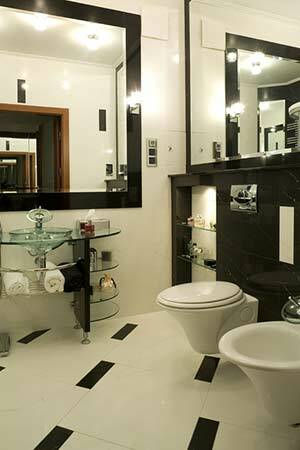 Mirrors will make the bathroom look really attractive and the reflections will aide in making it look roomier. Las Vegas Lights - Yes, small rooms cry for good lighting! Bright lights like in Las Vegas are a great way to drive away the gloom and depression induced by small spaces. Pay special attention to the grooming areas and make sure they get sufficiently bright light. Don't be afraid to experiment with your lighting: use sconce lights or recessed lights to maximize the brightness quotient. 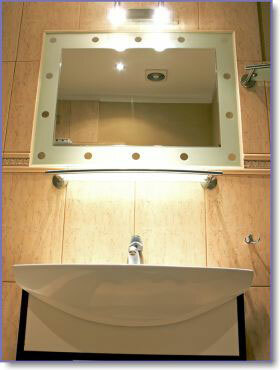 Visit our page on Modern Bathroom Lighting for ideas, practical guidelines and photographs. Window Dressing - The window/s to your bathroom is also the opening that allows for natural light and ventilation. Whether you have one window or two, no matter what their size, a sheer glass window is the single major source of natural sunlight in your bathroom. So, don't block it! Louvered window shutters, mini blinds and pull-ups work great as they allow for light as well as privacy. If you'd love to use glass, but are afraid it may compromise your privacy, cover the lower half of the glass window with sheer fabrics like net or lace shades (or sandblasting). You can use a single or multiple color fabric and even throw in some sequins to create a magical feel without compromising on the privacy factor! Open up the Shower - Frameless showers are commonplace, but they shrink down the already small bathroom making it look even smaller. An exposed shower is a great way to open up the bathroom space and enjoy the resulting visual appeal. An open shower is commonly used in Asian countries and the trick here is to floor the entire bathroom with the same style of ceramic tile. Only the shower half of the floor should be gently sloped towards the drain. Fix a low flow shower head and you've ensured that water won't splash everywhere when you shower. You can even use a frosted or stained glass open partition with a height of 5 to 5.5 feet. This not only provides some privacy, but also allows for proper ventilation and a flow of natural light, without cramping the space. Designs for small bathrooms are about some common sense and tons of creativity. Exploring tricks, treatments, and tips that work best for your small bathroom can yield the desired results. Raise the ceiling by using visual tricks like vertical stripes on the walls, tile borders at the place where the wall meets the ceiling, molding (wood etc), and cornice to draw the eye and give the illusion of a higher ceilings. Sweeping floor design - and especially diagonal lines - help visually stretch the space. Use a light colored, same style floor tile. Get rid of any visual obstructions, bulky cabinetry etc. Use pedestal sink instead of a vanity, or a cantilevered vanity that gives the impression of 'floating' in air. Mirrors are a bathroom designer's best friend. They stretch small spaces and fool people into thinking they are larger! Using a mirror from one end of a long wall to the other will open up the room and make it look wider. It will also reflect the bathroom assets in the best way possible. In your designs for small bathrooms, take a look and see if you can place two mirrors facing each other to promote a boundary-less room! Some of the designs for small bathrooms featured on this page are with the kind permission of Sun Resorts Limited as per the copyright notices on the images. 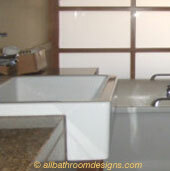 Ultimately, the whole purpose of our small bathroom ideas is to create a space that is warm, relaxing, and welcoming. And that's what these designs for small bathrooms can help you achieve!